Image being able to ride any time you felt like it. Day or night, rain or shine, none of that matters when you have an Indo balance board. Indo Balance boards are great for training off the water, developing your skills, killing time and laughing at wipe outs. 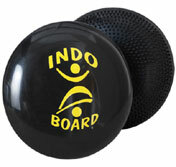 Indo Balance boards are also a great way to stay in shape. IndoFLO Balance Gigante Cushion 24"